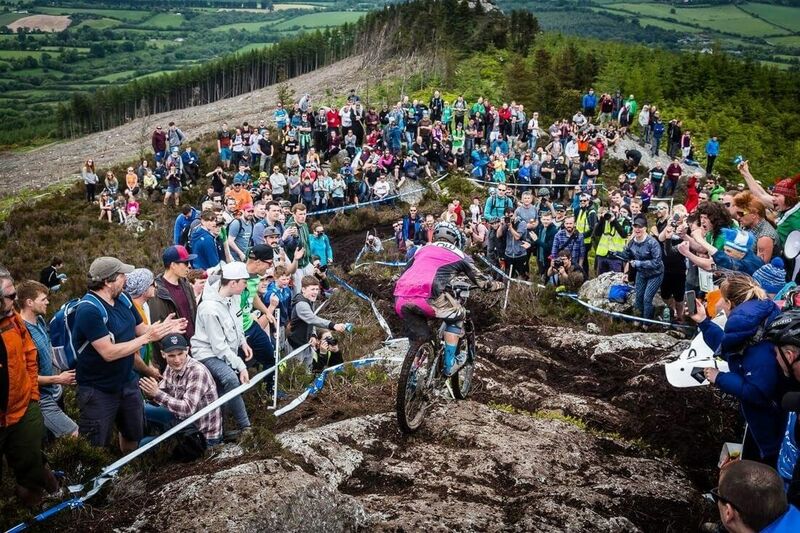 When the EWS comes to your home country it’s got to be the most important weekend in your race calendar. With six challenging stages, tough climbs and tight transition times the crowds turned out in their droves. After the glorious sunshine that greeted riders on practice day they may have thought they’d be in for a dry race day, but that was definitely not the case; torrential rain Saturday made for a huge contrast in conditions and the once dry, dusty tracks turned into a wrath of wet, exposed slippy roots, deep ruts, slick rock gardens, deep gullies and stodgy mud! It was a test of rider’s skill, strength and stamina that got them through the day as well as a ‘no fear’ commitment when attacking the technical sections. It was a weekend Michelle will never forget, here’s her race report. I spent hours giving my Transition Patrol a full valet, ensuring it was in showroom condition and in perfect working order. I had left it in with the lads at The Bike Rack Dublin the week before for a full check over and a brake bleed so I knew it was mint. Tyre choice was a big factor today as dry weather was forecast with potential rain on Saturday. I decided to play it by ear and go with my usual tough, high grip WTB Vigilante on the front but changed my rear tyre to a fast rolling, tough Trailboss on the rear. After the rain on Friday night however, I changed over to a tough, high grip WTB Vigilante on the rear for maximum grip! These tyres performed superbly on the greasy stages and are a tyre I have always had so much confidence in. I made sure my OLFI Action Camera was fully charged and ready for action! This was one thing I always use in practice so I can watch over the footage the night before a race to learn the tracks. The format was simple, practice day one – Stages 1,2,3 and 4. Practice day two – Stage 5 and 6. Friday, day one, was a scorcher of a day and the tracks were mint. It was tough in the heat, especially for a ginger! I got through the day great, had a blast on each of the stages and felt strong and fast. Day two, Saturday, was a different kettle of fish. With rain forecast, we weren’t quite prepared for the torrential downpour that was to come. There was no let up with the rain all day either so the tracks were completely different and some sections almost unrecognizable. This was the newly built stage and was one that, in the wet, exposed completely different challenges to the rider. Dropping straight into the stage, I was feeling confident and rode well through the greasy track, over the two rock slabs and down to the next corner. It was here at the rock drop that I crashed, taking an over the bars losing valuable seconds. I picked myself up and really went for it for the rest of the stage. However, another crash at the very tricky tight turn down a steep wet bank onto the fire-road, lost me more time and with crooked bars I had to get off the bike to straighten them before continuing onto the finish point. I felt so disappointed with this run, finishing 29th, my worst stage, I was determined to ride clean with no off’s in the next stage. Talking to other riders along the transition who had just finished stage 2, assured me that everyone had a bad run on Stage 1 and that the rest of the stages have a lot more grip. This was reassuring! Stage 2 was last year’s stage 1. I was looking forward to this one as there are some wooded sections where you can really pick up speed and have a blast on. I rode better on this stage but didn’t manage to have a fully clean run! Catching up with the rider in front, I knew I was going fairly well, but with such a stacked field of awesome riders, I still only managed a 25th in this stage. This was the one that I was hoping to really nail! Starting up on the big rock, this was the second biggest spectator viewing point as it was a very technical rock section and one that the crowds love as it really tested riders skills and bravery! This is where the Patrol really performed and was absolutely solid in the technical sections. Thanks to my good friend Mateja for catching my run down the GREASY rocks! The crowds were just insane, it was such an absolute adrenaline rush and was amazing to experience this kind of support. The roars, heckling, cheering, it was just something else! The rest of the stage went pretty well for me, I kept it pretty much clean til the end with maybe one little slip up. With a 22nd position in this stage, things were starting to get better!! At this point, I was starting to feel fatigue setting in. With so little time to rest between each stage, it was a case of finishing a stage and getting straight back up the hill climb to the next. I felt sorry for anyone who had a mechanical or a bad stage run as even without this, we were under pressure to get to the next stage on time. I didn’t stop at the food stop until the transition to the final stage, as luckily I had enough water and supplies to keep me going throughout the day. The stage went well, I don’t remember much about this one but I do remember it being really greasy through the tight trees at the bottom section and having to do a lot of foot out cornering! With a 25th position I reckon I could have pushed harder. After a brief lunch stop where I could only stomach a protein bar, put some oil on my chain and caught up with a few people, it was back up the hill for the final two stages of the day. I was feeling it at this point, the constant pedaling with no let up and physically not being able to eat meant that I reached stage 5 feeling pretty whacked. I got to the top, composed myself, and took on some carbohydrate drink. It was a slow start in the mud, but once I got to the steep rocky section it was the massive roars from the crowds that got me going and I had a super clean run down the steep rock garden, railed into the left-hander and sent it over the ski-jump to the roars of the crowds….it was insane!!! I nailed this stage, totally clean run and really pushed it to finish with my best run in 19th position. Now I had just one more climb back up the hill to do and to tackle the now famous ‘Carnage Corner’ on the final stage – Emerald Express. Being the last climb of a very tough day, I was very glad to be at the start line at this point. We had been going non-stop for six hours at this point, had tackled the hill six times with bikes caked in thick, gloopy mud and now it was the much loved (and hated) carnage corner to get down. I had practiced this before, just not in these conditions so when I got to it, it was completely unrecognisable! The crowds here were so loud, so crazy, it was hard to focus on the task at hand! I got down the tough greasy rock garden well but lost the front wheel just before carnage corner and slid out. I pointed the front wheel into the turn but somehow lost control and smashed into the tree where there were supporters roaring and ooohing : ) A little winded and shook, I took one look at the next drop and had to walk it. I have never had to walk this section before, and knew it well, but after the hit I took, and the change in conditions, I think I made a wise decision! I hoped back on the bike but struggled to clip my left foot back in so I was a little slow on the next bit. Finding my flow again, I finished the stage as best I could and finished in 21st position. Massive thanks to my sponsors for their continued support and encouragement!